On December 12 1963, the Union Jack was lowered and the Kenyan flag hoisted to mark Kenya’s independence. Most of the Union Jacks that were lowered across the country and on the high seas that morning were, however, distinctively representative of the Kenya Colony. They were also very ugly. The Union Jack was the official flag across the British Empire. As the Empire grew, its officers and merchant ships needed to distinguish each other while maintaining their common British connection. In British tradition, the Red Ensign is a red flag with the Union Jack in the top left corner, next to the flagstaff. It is only flown by British-registered ships. The Blue Ensign is one of several blue ensigns flown by certain organizations or territories associated with the United Kingdom. The flag of England and the flag of Scotland were merged into the flag of Great Britain in 1606, three years after James VI of Scotland inherited both the English and Irish thrones as King James I. At the time, it had two crosses: St. Georges Cross, a red cross juxtaposed on a white background and? Saint Andrews Cross, also known as the Flag of Scotland, a diagonal white cross on a blue background. The red saltier of Saint Patrick was added in 1801 to mark the formation of the United Kingdom of Great Britain and Ireland. The Imperial British East Africa Company (IBEACo) had three flags. 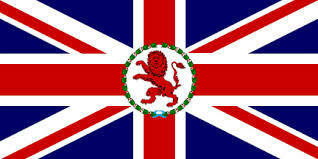 Each consisted of a Union Jack, a sun with 16 rays, 8 shorter and 8 longer, and a crown. One had the crown and the sun in a white disc surrounded by a garland on Union Jack. 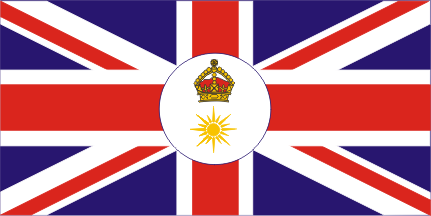 The other two had the Union Jack at the upper left corner and the crown atop the sun a distance from the right corner. The badge design was termed by Hulme in Flags of the World (1895) as one of the simplest, most appropriate, and most pleasing of all the colonial devices. It was simple, elegant, and majestic. Another flag was used within Witu Protectorate, the first mainland territory ceded to Britain by the Sultan of Zanzibar under the Anglo-German Heligoland Treaty of 1890. It was a red Arab flag with a small Union Jack in the center. In 1920, Kenya became a British Colony. To distinguish between the colonies, each first Governor had to select and propose a badge that would be placed on the Blue Ensign. By rule, the badge had to be placed inside a circle whose diameter was four-ninths the length of the flag’s hoist. Badges such as Kenya’s that were not circular were set within an imaginary circle of similar dimensions. The badge would also be placed on the Governor’s Flag. 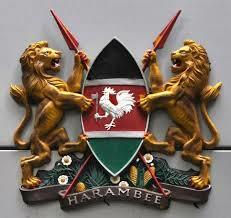 The badge that the Kenya Colony ended up having on its flags had a poorly drawn red lion “aggressively walking on its hind legs”, with its head facing the viewer. In the Governor’s flag, this sad lion was encircled by a wreath placed in the intersection of the crosses. 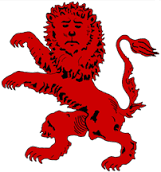 The red lion badge design was one of the worst in the Empire. “Whoever designed the badge of Kenya was no heraldic artist, for it is a very poor specimen of a lion rampant guardant in red,” wrote Wheeler-Holohan in Flags of the World (1939). In short, whoever drew the lion had probably never seen one, even in pictures. Or he let his three year old design the flag. What happens when you hire an illustrator on a tight budget. 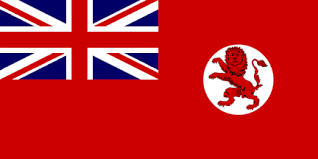 The unofficial merchant ensign of the Kenya Colony was a variation of that official colony flag but with a red instead of blue background, and the red lion situated within a white disc. 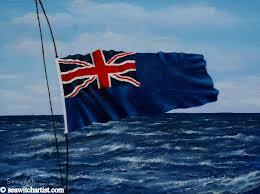 It was not exactly illegal but it was not an internationally recognized maritime flag. It was only relevant within the territorial waters of the British Empire where it could be used to locate a ship’s home territory. Wait, is this lion sad? Melancholic? Is it sad to be on the flag? Why would anyone do this to a lion? To be registered, the company had to either move its main office and registration to Nairobi, or apply for registration through a British subject. 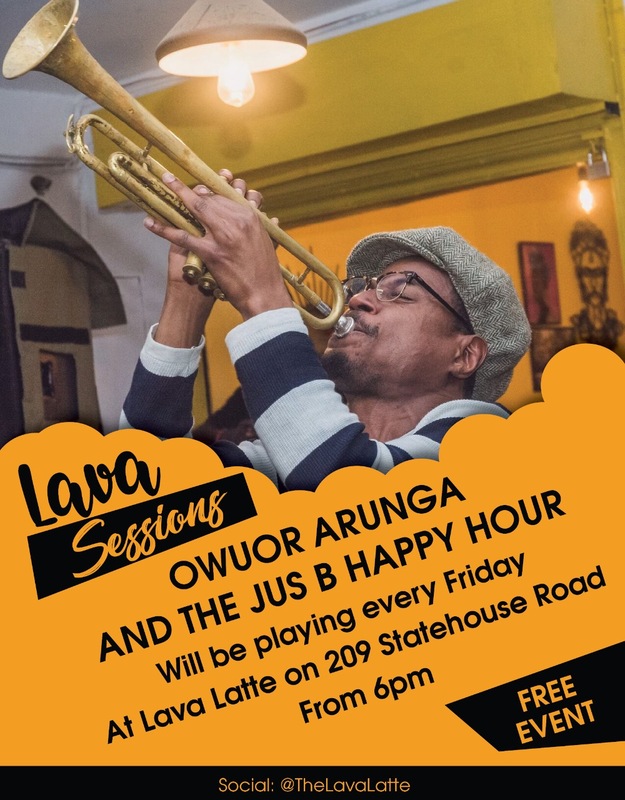 Such cases ended at Independence when the Sultanate of Zanzibar ceded of the Kenyan coastline to the new government, uniting the country into one. The need for a distinctive flag on land, especially at international sporting events, increased the use of colonial Blue Ensigns. Whatever form of the flag took there was always a full Union Jack somewhere on it. The placement of the badge in the lower fly made it much easier to see in almost any circumstance. This defaced the ensigns but it was the most popular design among flag manufacturers. Manufacturing a flag with such a sad lion that looked like it had been forced to audition for TPF must have made proper illustrators cry. In 1963, the badly drawn lion disappeared with the colony and it was replaced by the current green, white, and red national flag with a shield and crossed spears in the middle. The only lion (s) that replaced it are on the official coat of arms, this time magnificent, heraldically speaking. At least they are holding on to something, that colony lion looked like it was in the middle of a dance. This article was first published on the Daily Nation, November 17, 2013.